The nation forming influence of horses, riding and the equestrian wanderings during the history of Hungarians is the most apparent in the love of horses that is present up to now. The ancestors of Hungarians used to live in the centre of the Eurasian nomadic pastoral life where they took active part in the domestication and utilising of horses. The best-known historic Hungarian horsemen are the hussars whose foundations go back to the Hungarian wandering ancestors. Light cavalry corps were used to be typical of the equestrian-nomadic peoples of the Eurasian steppe from the ancient times until the 19th century. Their horses and weapons were light, their most important equipment was the bow. Ambush and return from a pretended escape were very characteristic of their tactic. This tactics became accomplished during the Magyars raiding over Europe in the 9-10th century. The first regular hussar-regiment was set up by Maria Theresa Habsburg empress. Hungarians brought Hussars as a corps - with their decorated uniforms together with their saddling technique - into general use all over the world, from France through Russia to America. Magyars led revolutionary innovations on several occasions. Maybe the most important of the Hungarian equestrian inventions was that of the carriage. As historians claim the coach could have been named after a small Hungarian village "Kocs" (pronounced "coach"), between Vienna and Budapest, that lived on carting and making farm wagons. In the development of harnessing tools, in the use of traces, trappings, bridles and also in the rise of the various driving methods (two-in-hand, four-in-hand and five-in-hand), Hungarian inventions and methods had a high impact on the world outside of Hungary. The first Magyar settlers of Hungary are remembered by those traditionalists who reproduce the war games of that era with their horse-shows. Their equipment consists of bows, sabres, spontoons and spears. Their traditionally prepared, wooden-framed saddles fit their horses, the Turkmenian breed, which recall the past for the visitors just as well as their yurta accommodations and their ancient dishes. The traditions, equipment, tools and buildings of nomadic pastoral life are preserved and fostered at many places in Hortobágy and Bugacpuszta - in the possibly most magnificent plains of Europe. The Puszta (Great Plain) is unique in Europe, with its whitewashed farmhouse walls, fields of bright red paprika, sweep wells, thatched csárdas (roadside inns), galloping horses and stud farms. And while the Great Plain is easily accessible, it is not spoiled by busy roads or railways. The land is refreshingly unmarred by the heavy hand of civilization, has a unique flora and fauna - and a flat terrain that makes it excellent riding country. Hungary’s indigenous species live here in these wonderful territories: Hungarian grey cattle, buffaloes, and Hungarian species of sheep “Racka”. Uniquely in Europe horse herders’ saddles without girth (patrac) are typical in this area: they help to follow the run away herd of horses without delay. The unique clothes and the long whip are also very characteristic of the Hungarian horse herder, the „Csikós”. Many of them are masters of the famous „Puszta Five” , a feat of equestrian skill that involves three steeds in front and two in back, on which the csikós stands, steering with the reins. 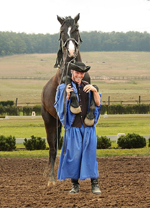 You can see horse shows at numerous riding centers and horse farms. We take you to the miraculous Puszta, where you can see the grassy plain which is one of the most beautiful sights of the European tourism. 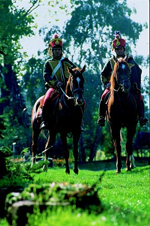 During the puszta–visit you can become acquainted with the fauna and flora, see the traditional Hungarian domestic animals, take part in a horse-carriage trip, participate on a spectacular horse- herd performance and can ride a horse too. The program includes home made apricot brandy and cheese scones as welcome drink and snacks and a fine 3-course lunch in a traditional restaurant of the Hungarian Great Plain. On the verge of the 21st century there are only few places in Europe where tourists can ride a horse or a carriage as freely as in the romantic and picturesque regions of Hungary. Travelling through the Lake Balaton’s unique landscapes on horseback provides an exhilarating and a marvellous way of experiencing the fantastic scenery. All horse fans - should they be sportsmen with excellent riding skills, hobby riders or just horse lovers who enjoy watching horses - will find a suitably attractive program in the abundant supply. Visiting stud farms makes a lively program among the equestrian tourist offers. Hungarian horse breeding is flourishing again nowadays. Horse breeding associations guard the purity of breeding, quality and the retaining of the unique characteristic of certain breeds. The half-bred from Kisbér recalls the military riding horses of the last century: it is elegant in appearance, beautiful in carriage, intelligent, with a solid constitution and at the same time light in movement and easy to ride. This breed is especially favoured by hobby horse breeders and trail riders. The famous grey Lippizaners, this baroque-looking, extremely intelligent, four-hundred-year-old breed justly has a good reputation in racing sport. Breeding Lippizaners is the most popular in the environment of Szilvásvárad, in the northern-Hungarian Bükk mountains. Nonius breed was raised in the Mezohegyes Stud 160 years ago. This Hungarian breed is unique in its appearance all over the world. Its high neck-jointing and slightly round side-view of its head give this favoured breed of the horse-shows an impressive, baroque appearance. The admirers of the Arabs will definitely find pleasure in the Shagya Arab breed raised by the Bábolna and Radautz. Its aristocratic appearance, spirit and potentials makes it excellent equally for cross country and hunting rides. The Furioso-North Star is a very stable horse, powerful and massive enough to complete any kind of transporting task in carriage. The female line of the breed is more than 200 years old. Hungarian horse-breeding is praised by the all-time most famous race-horse, Kincsem, the miraculous, unconquerable mare. Between 1876 and 1879 she run 54 races at Europe’s biggest race courses and won on each occasion. The champion of Epsom Derby, Kisbér; the Bábolna-bred Imperiál; the record-holders of trotting races, Baka and Elly; along with the great world championships winner carriage horses all deserve fame.